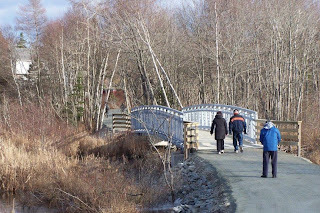 The new Bissett Brook Bridge is a dream come true for me, and the many cyclists and trail users who are now able to leave home and travel to the Heritage Park, Salt Marsh Trail and the Shearwater Flyer and beyond. Not having to drive by automobile to the trails is not only environmentally friendly, but it opens up space at parking lots for those who travel longer distances. The favourable comments received from trail users have been overwhelming. Our Bissett Trail offers a tremendous variety of wildlife and plants to its many visitors. The trail located at Colby Village in Cole Harbour has quickly become a favorite trail for the many residents living in the area. It is just amazing on how much wildlife and beautiful plants and shrubs exist in that area. Here are pictures showing just a few of the beauties. Enjoy the pictures and hope to see you out on this trail soon.